The Neville Shulman Challenge Award aims to further the understanding and exploration of the planet - its cultures, peoples and environments - while promoting personal development through the intellectual or physical challenges involved in undertaking a research project or expedition. The Neville Shulman Challenge Award was established in 2001 for the Society by Neville Shulman CBE. Each year an award of £5,000 will be given to a challenging research project or expedition. The project can be desk or field based, and carried out in the UK or overseas. Applications are invited from both individuals and groups. Please read the application guidelines and submit your application to grants@rgs.org. The glaciers that feed Central Asia’s two major rivers are melting at an unprecedented rate, with scientists warning that they could disappear completely by 2050. 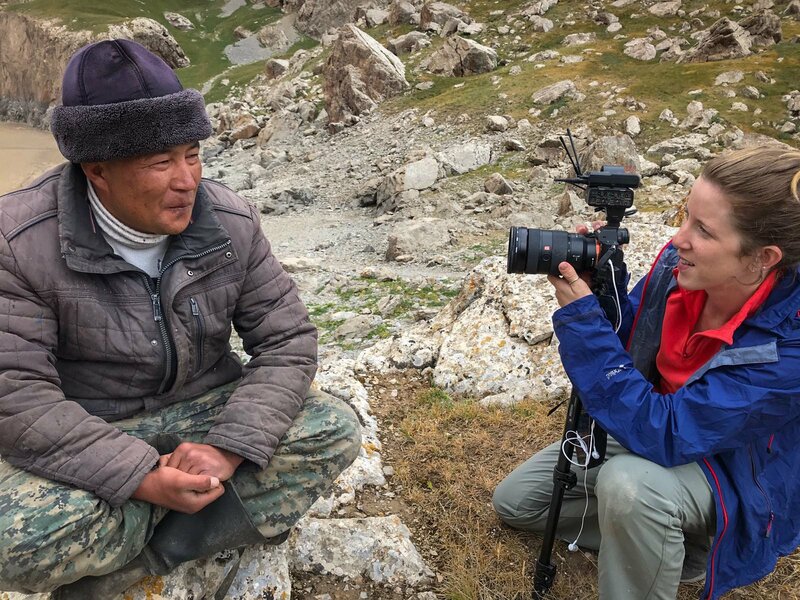 By travelling the length of Kyrgyzstan’s Naryn River - by foot, horseback and bike - journalist and filmmaker Katie Arnold will document the social, economic and political impact that climate change is having on those living along its path. Her journey will end in the Fergana Valley, the largest irrigated area on earth, and a volatile region on the brink of an ethnically charged water war. In April 2017, Leon McCarron travelled to Israel to meet the Samaritans, the world’s smallest and oldest ethno-religious group. Despite once boasting over a million adherents, their population now numbers well under a thousand. Joining them for their week-long Passover festival, Leon's journey explored the Samaritans' rich past and the challenges they face in the 21st century. Recent exploration of Mozambique's formerly off-limits mountains has shed new light on their biological uniqueness. Due to numerous new species being discovered and their unique species assemblages, these findings suggest that Mozambique's mountains may comprise a distinct ecoregion to other highlands of the East African Rift. Forming the key highland link to the north, the Njesi Plateau has escaped almost any biological attention. The expedition undertook the first biological exploration of the plateau, establishing the limits of this purported new ecoregion. Throughout February and March 2016, Tim Oakley led a team of three men and 22 dogs across Arctic Canada and Alaska, sledging over 800 miles through what is one of the world's coldest and most remote wildernesses. The aim of the expedition is to retrace Roald Amundsen's sledging journey from Herschel Island to Eagle, to let the world know of his successful navigation through the North West Passage in 1905. 111 years later, the team recorded their journey to compare it with Amundsen's, and engaged with schools to highlight the changes that have taken place in this fragile environment. Daniel sought to explore and record details of major mountain ranges of West Kalimantan (Indonesia) and Sarawak (Malaysia). This information, including GPS tracks, will be made available to all, including flora and fauna conservation groups, eco-tourism authorities and local and international hiking clubs, on the Gunung Baggin website. The Cerros del Sira is a rugged satellite of the Peruvian Andes. Isolated from the main Andean chain and with a high range in altitude, the area hosts a unique but poorly understood species assemblage. The Exploration Sira team performed a rapid-assessment scientific survey within the Cerros del Sira range, aiming to both document its species assemblage and use it altitudinal range to better understand the processes governing the diversity and distribution of the amphibians and birds which reside on its slopes. Patrick had a unique invitation from one of the last sabios, wise men, of the Ocaina to learn about local philosophy, traditional medicines and spiritual understanding. Learning 'from the inside' gave Patrick a unique perspective of an ecosystem immensely important in today’s world. An international team of six women sea-kayakers and social scientists traversed the 250km length of the volcanic islands that reach from the northern tip of Sulawesi, Indonesia, to Sangihe in the Celebes Sea. In addition to undertaking this unique kayaking challenge in a dynamic and changing environment, the team will observe, document and engage with life in the archipelago’s ‘liminal zones’: the rapidly changing, sensitive marine coasts from which people eke a living, increasingly through seaweed farming. This project searches for the rarely sighted Slender-billed Curlew, from its wintering grounds in Thrace to its breeding area in Siberia, to understand the fate of the bird and the degradation of water resources across its migratory path. Listen to highlights of the journey on the BBC's From Our Own Correspondent. For eight months of the year, the ‘Chadar’, a gorge deeper than the Grand Canyon with temperatures as low as -30°C, is the only way in or out of the remote Himalayan kingdom of Zanskar. This team travelled through the Chadar in winter to document its role in Zanskar life and to start an educational radio service to enable the children of this isolated region to receive year round education. Renowned photographer Nick Danziger investigated the progress of the United Nations Millennium Development Goals in eight of the world's poorest countries. With only five years left until the 2015 deadline to achieve the goals, Nick travelled to Armenia, Bolivia, Cambodia, Honduras, India, Niger, Uganda and Zambia to see what impact they have had on some of the poorest communities in the world. A multidisciplinary research expedition to explore the rainforest on the island of Borneo. Combining research and educational strands, it focused on raising awareness of the conservation issues affecting the Heart of Borneo rainforest. Following the course of an old-trade route the ‘Jalan Raya’ (Great Road) in Indonesian Papua, along the central mountain spine of the Papuan highlands, from the Kapauku Tribes of the Wissel Lakes in the West to the Dani Tribal territories of the Baliem Valley in the East, the team documented areas that have remained almost completely unvisited. A journey on foot of approximately 600 miles from the Black Sea to the Caspian, through one of the most linguistically and culturally diverse regions on the planet, this project examined the myths and realities around the real voices and stories of the patchwork of peoples living in the high mountains on the southern slopes of the Greater Caucasus. The team assisted the San, some of Africa’s oldest inhabitants, in improving their food security and nutrition through cultivating home gardens. Following the course of the Xingu River in Brazil by boat from its source in Xavante territory, through the Xingu Indigenous Park, to the town of Altamira where the river joins the Amazon - a total distance of about 2000 km. This expedition documented the current situation of the indigenous people, in terms of their health, education, culture and security. With a focus on the tradition of canoes in the Tokelauan culture, this expedition aimed to build and sail a traditional canoe from Fakaofo to Western Samoa, 300 miles and 5-10 days away. Unfortunately this project was not completed. Accompanying the Nahura on their trips to the headwaters of the Manu River in Manu National Park, this project documented the cultural importance of the rainforest for indigenous peoples of Peru. Nine sea-kayakers, including two disabled paddlers, became the first inclusive team to undertake the 1000 mile journey known as 'The Inside Passage.' Expedition challenges included open water crossings, restless seas and a harsh landscape for three months, paddling through the fjords and glacier draped mountains of the Alaska and British Columbia wilderness coastline. Compiling detailed case studies of local reconstruction in post-war cantons, this project served to make stronger linkages between Bosnian, Serbian and Croatian local leaders and social scientists and their Western counterparts. The project tested specific ideas regarding post-communist and post-war reconstruction in mountain communities. Over 18 months, a team of environmental scientists, mountaineers and divers, carried out glaciological studies around the coastal zones of the Antarctic continent, documenting Persistent Organic Pollutants (POPs) said to be 'one of the great environmental challenges the world faces'. Beginning in Auckland, New Zealand, the team sailed steel, ice-strengthened ketch, 'Gambo', via Tierra del Fuego and a number of sub-polar islands, to the west Antarctic Peninsula. In June 2014 Patrick and Richard completed the first unsupported, un-motorised crossing of Papua New Guinea, having successfully navigated their way north to south. You can watch a film about their journey here.